Disclosure: I will receive a copy of this DVD as a thank you for posting this giveaway, by Partnershub. No monetary compensation has been or will be received for this post. Check out the LEGO Bizarro Name Generator App. Type in your name to reveal your Bizarro alter-ego - If you don’t like your name, press the refresh button or try again! You can also watch the official trailer & click the box art to bring the Bizarro League home today! 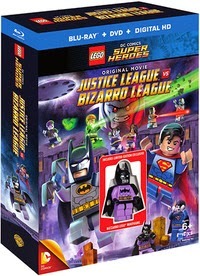 You can win a copy of the LEGO Justice League Vs Bizarro League Blu-ray for your family. Simply enter on the rafflecopter form below!